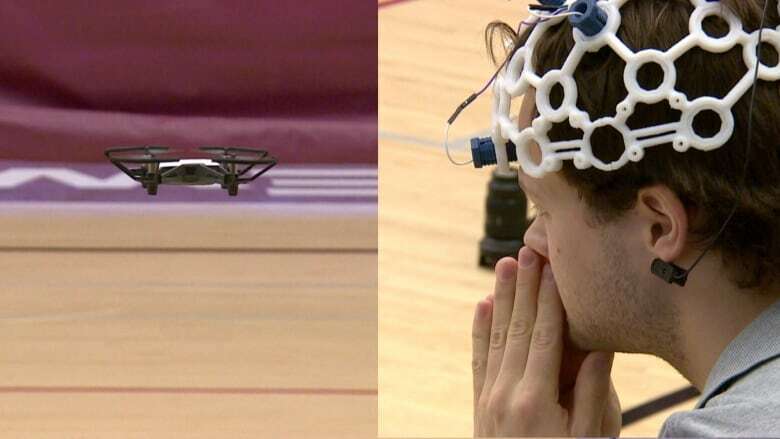 Four MacEwan University students built a drone they can steer with their brainwaves. It takes specific thoughts to make it move and lots of concentration to keep it up in the air. Think of one action you do every day — press the gas pedal, lift up a cup, do a pushup. Chances are, it comes pretty easy. Now clear your mind of anything else except that thought. That may not be as easy. That's the task Stephen Doyle, a MacEwan University computer science student in Edmonton, has to do when he flies his team's drone — because it flies using his mind. Doyle, along with John Simmonds, Mark Reid and Alex Crowder, built this drone to fly using brainwaves. Wearing an electroencephalogram (EEG) cap, Doyle trains a computer to tell it what thought indicates what direction. In order to move the drone up, for example, Doyle thinks about pushups. But he has to remain very focused, lest he lose his thought, confuse the computer, and crash the drone. "The first time it flew, and the excitement took over that there's a drone flying right next to me because of something I'm thinking, everything went out the window," said Doyle. "We may or may not have crashed the first drone quite aggressively," he added. But for the team, this drone shows what else could be done with this technology: mind-controlled wheelchairs and prosthetics are just a few possibilities. To hear more from Stephen Doyle, download our podcast or click 'Listen' above.